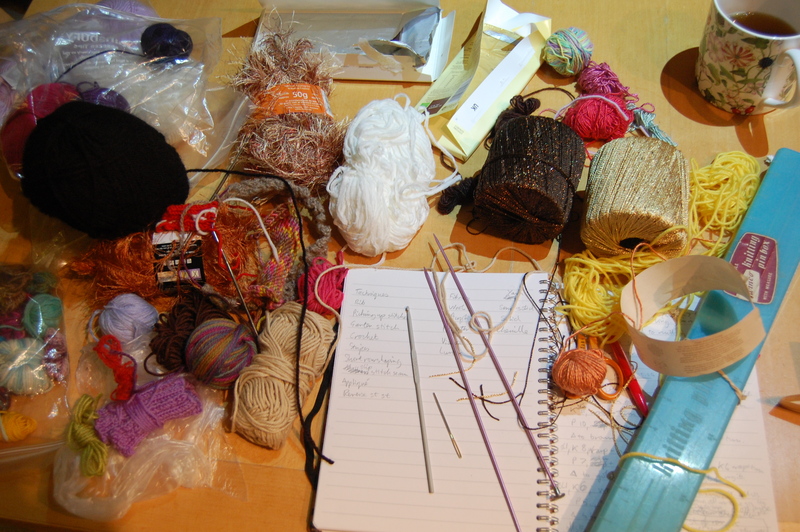 Sadly I can’t go to the fabulous Wonderwool show in Wales this weekend. But…my lovely new cowl, Song of the Sea, and it’s capelet companion, Midnight Ocean, will both be there. You can visit them in person, as it were, on board the Fyberspates stand. They will be feeling nicely at home since they are both knitted in Fyberspates’ gorgeous yarns. I’m delighted Fyberspates asked to show them. How about some Mitts that contain as many ornate knitting techniques and dubious yarns as possible? The Emperor’s New Mitts were created because the Fingerless Glove Fanatics’ April knitalong voting got a little out of hand, if you’ll pardon the pun. 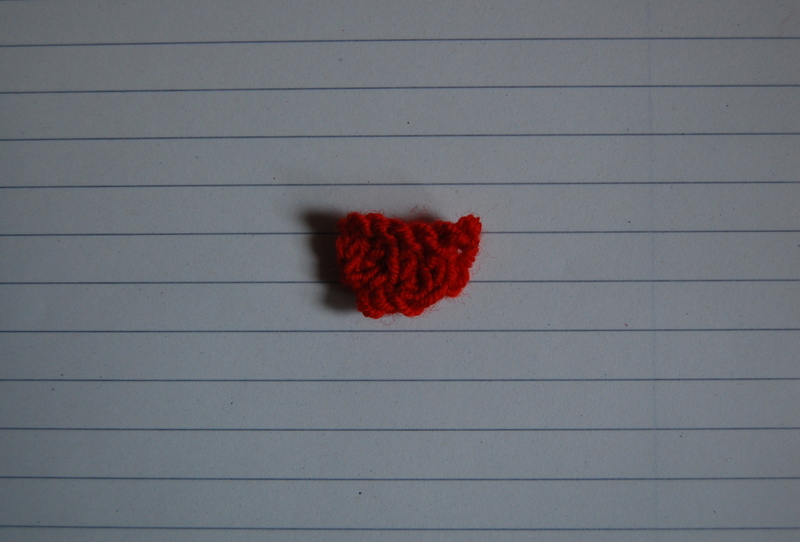 I did promise to make a version in actual yarn, as did a couple of other knitters. 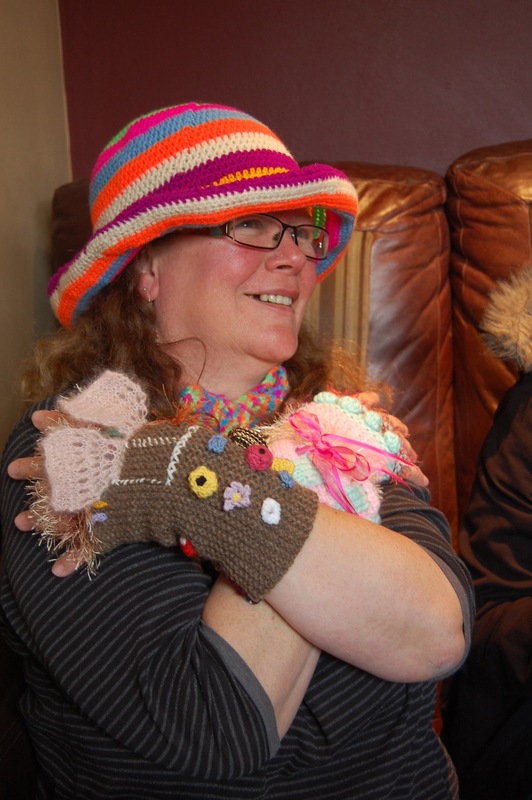 My “Gretel’s Grimm Mitt” met “Frankenmitt” at the FGF London meet on Saturday. And they both met Minty’s eye-watering crochet, specially created for the occasion. She was right, we definitely couldn’t miss her in that hat. 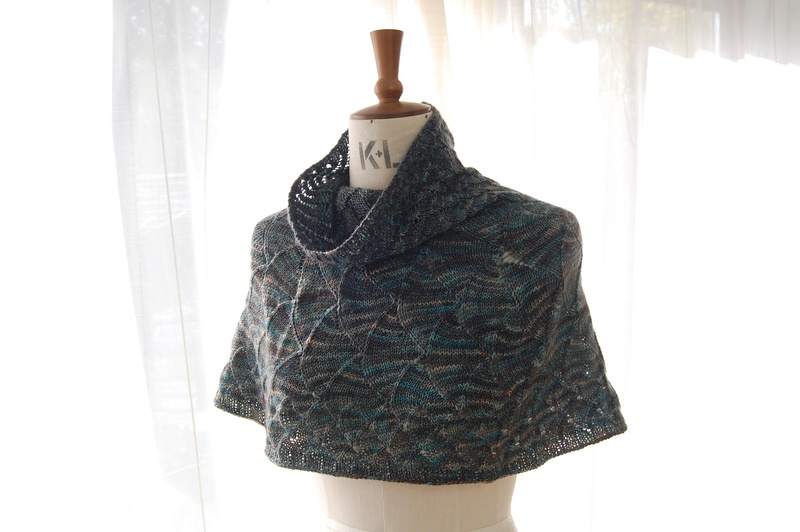 I’ve just designed Midnight Ocean capelet as a change from making triangle shawls. I love how cosy this generous cowl feels, even though the yarn is only 4ply. It stays on my shoulders instead of falling off constantly – no fiddling with it while trying to hold a glass of wine or a conversation. It’s going to be perfect to wear on chilly summer evenings, and apparently there will be plenty of those in the UK this year. I think it will be great under a coat in winter when the subtle sparkle will be picked out by twinkling lights. In a plain colour the clean Art Deco design would make it wearable on a journey to work. It feels very versatile to me. If you’d like to see more pictures, have a look here. 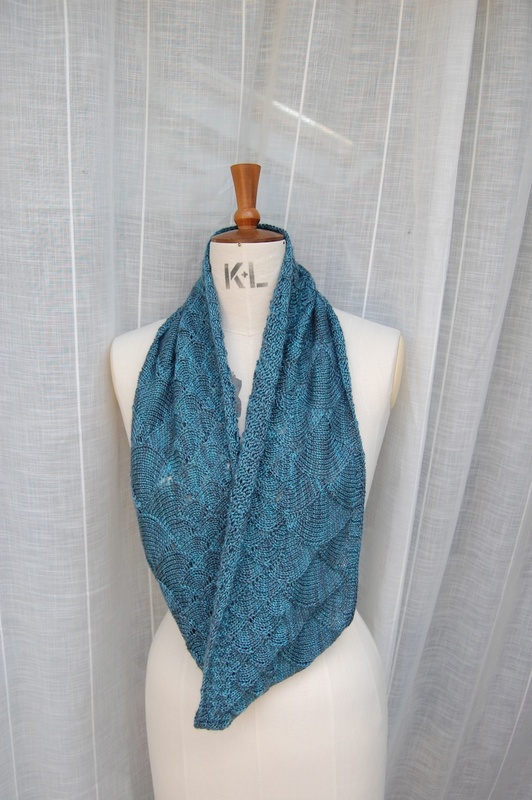 So, I’d like to know…what do you think of the idea of this little capelet instead of a triangle shawl? It started out as a simple request to photograph two kids’ cowls on her beautiful daughter and culminated in my friend being told by NYPD to “get that thing off the sculpture”. Two of my cowls were last seen on a statue of Gertrude Stein in Central Park, New York. 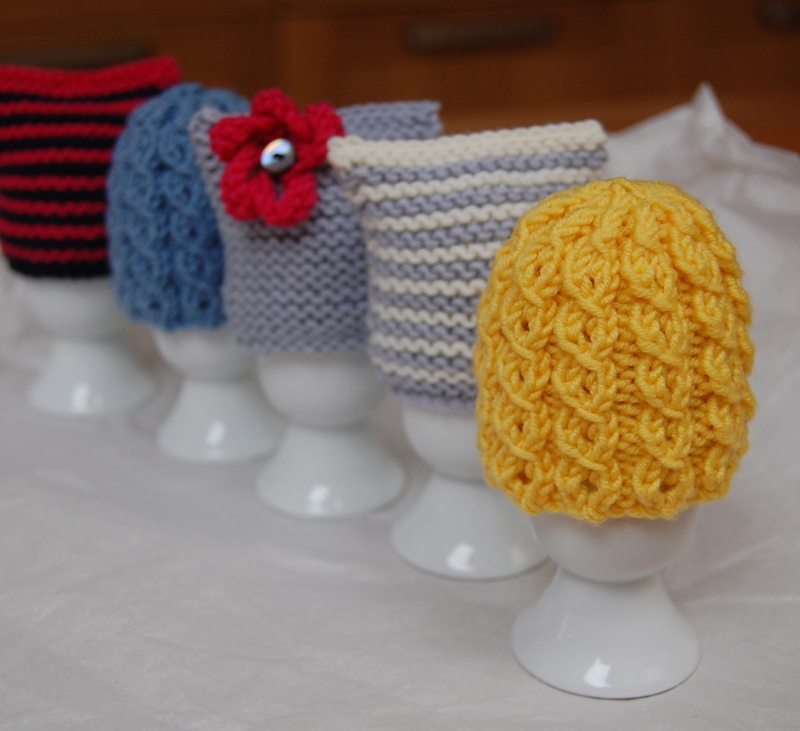 To say thank you for following my blog, here is a little Easter Gift for you….free patterns! This is the version that mere mortals can see- before they are blinded by its garishness.